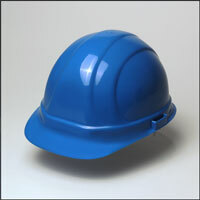 PRODUCT: #19136 HARD HAT, BLUE COLOR, OMEGA II, 6-POINT SUSPENSION, SLIDE-LOCK ADJUSTING SIZING SYSTEM. 6-Point impact absorbing nylon suspension. Sold in singles or cartons of 12.